Someone realizes they need a certain product or service. They uncover a need. They realize that they need to research the possible solutions. They turn to the Internet to begin their research. They use a search engine to start their research. They use the results of their research to compile a list of possible vendors. They contact these vendors for more information and send out a Request for Proposal (RFP). They receive the RFPs from qualified vendors and make a decision. Search Engine Marketing, as a part of Corporate Website Marketing, should play a major role because it helps potential customers research possible solutions and helps “get on their short list” of possible vendors. 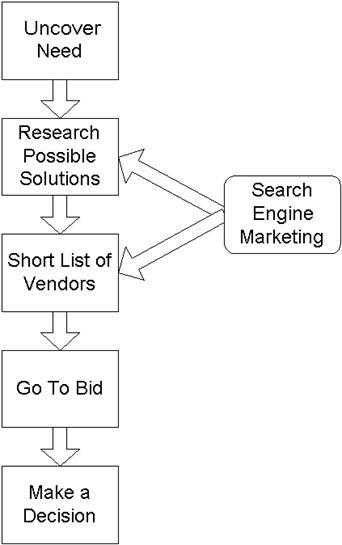 Corporations with long sales cycles and big ticket products and services cannot benefit from Search Engine Marketing. Spend less marketing $dollars than traditional advertising. The Search Engine Marketing Specialist must research the proper keywords (search terms) so that the company’s website is “found” for the words that actual people are using to find products and services that the company sells. The Search Engine Marketing Specialist must optimize the website and the website must include the right content for the visitors once they get to the website. “found” by the search engines and get listed properly. The Search Engine Marketing Specialist must submit the website properly to the search engines. The Search Engine Marketing Specialist must monitor and track the results on a regular basis and report the results to management. The influencers normally use specific searches, and they typically use three or more words. They are looking for the solution to a problem. They are also the most likely to respond to a “call to action”. They typically respond well to comparison matrixes, Webinars, trials and demos, and downloads. They are interested in getting spec sheets, white papers, product brochures, case studies, and newsletters. The decision makers, on the other hand, use the Internet search engines to perform high level searches. They typically use two or three words when they perform a search. They may search for a company or a competitor name; or an industry segment. The decision makers are less likely to respond to a “call to action”. They are more likely to pick up the phone and call; or delegate the research to someone else. They usually look at home pages, About Us pages, or a Comparison Matrix (market share). Ultimately, the decision maker uses the Internet search engines to validate his or her decision. Corporations can benefit from Search Engine Marketing and hiring a Search Engine Marketing Specialist to work with the company’s Webmaster. More sales leads can be generated for a fraction of the cost of traditional advertising. Corporations can associate its brand with its products and services. And corporations can tailor their message to the influencers and the decision makers.